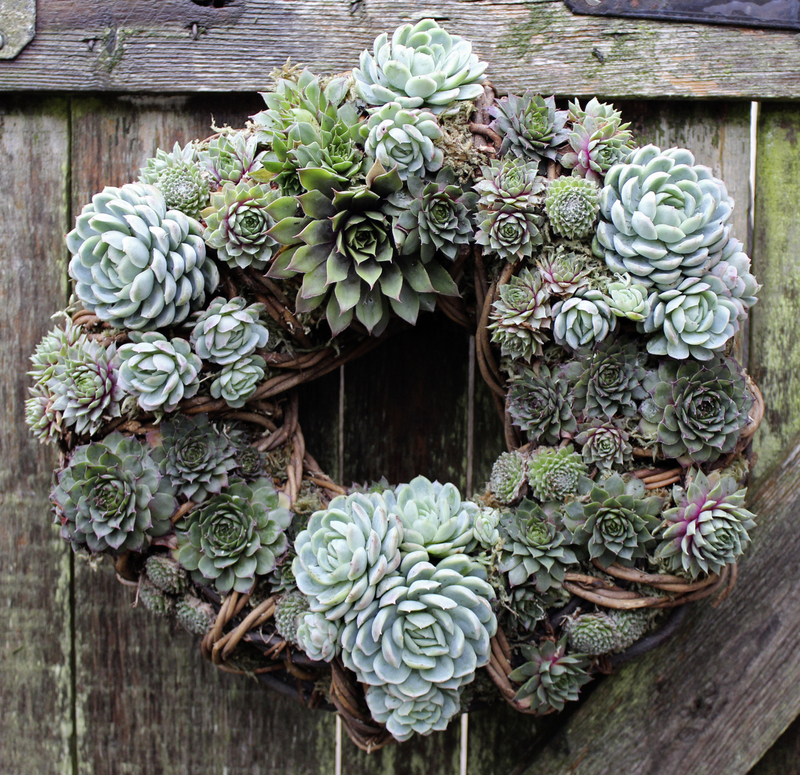 A few hours of creativity in the garden can lift the spirits in winter. My log store really needed to be relocated right by the back door, and it is the first thing you look at though the French windows. An old bookcase was put to work and it made this outdoor area part of the house again. 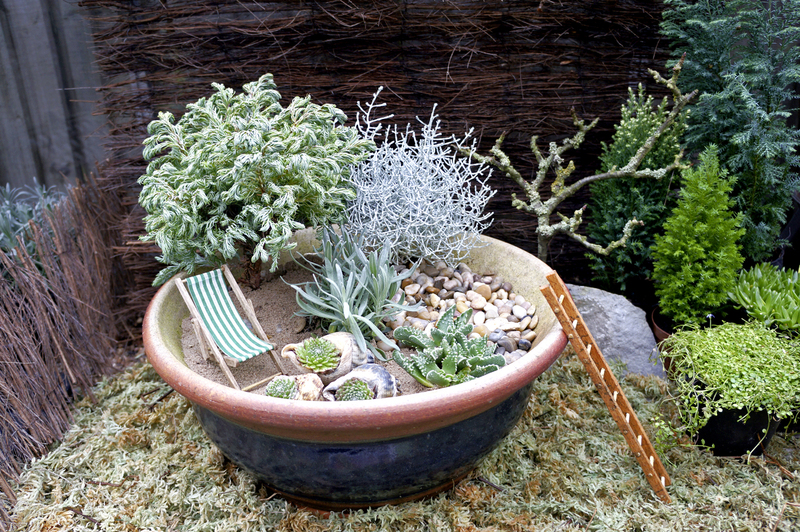 It also presented a spacious shelf for a container garden. Not only that but the pile of logs yearned for a bit of green. Up-cycling an old kitchen zinc laundry bath was destined for a start of a small fernery. I have gathered together gift ideas and decorations such as a Fairy Garden with a beach theme for children, a living wreath and decorative individual hanging plants. If you are yearning for a few ideas this winter, read on…. I used a white and purple colour scheme use the foliage as the main interest. 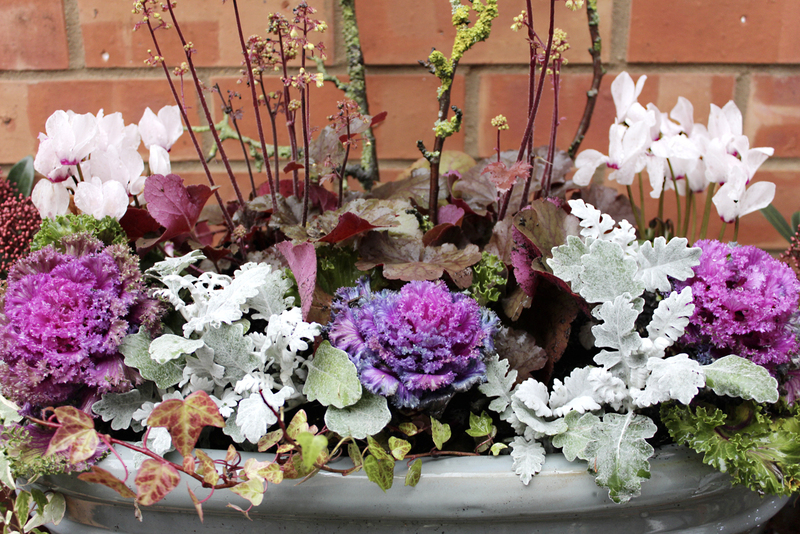 Cyclamen, purple cabbages, Dusty Miller a heuchera and some lichen covered twigs. The Heuchera tiny yellow flowers match the colours of the lichen beautifully. The skimmias look good in vintage terracotta pots. Purple and silver with a dash of lichen green. My new log store, though handy and close to the house, looked far too craggy and bare for my liking. Green is what I wanted and some ferns would be great over winter colour. Then I had an idea to post some baby fens into the log pile like they might do growing naturally in ancient log piles. A material like zinc will look good too. 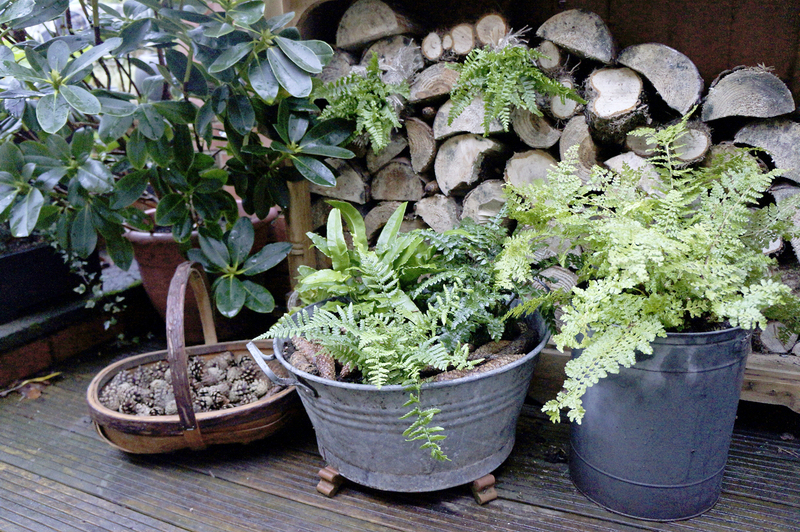 Continuing with the up-cycling theme, kitchen tubs and buckets are ideal and set compliment the fern leaves and logs nicely. I chose contrasting leaved ferns planting a Hart’s tongue (Asplenium sclopendrrium) and a Japanese tassel fern (Polystichum polyblepharum). 1. Drill holes in the container. 2. Wrap hessian around ferns that are to go in the logs pile. 3. Mix leaf mold with compost before planting. The fairies at the bottom of the garden need a holiday too. Its has to be the most enchanted place ever created so have fun with the most exotic and crazy plants that you can find. I chose a curly leafed conifer as the main tree, and a Calocephalus for its amazing colour. 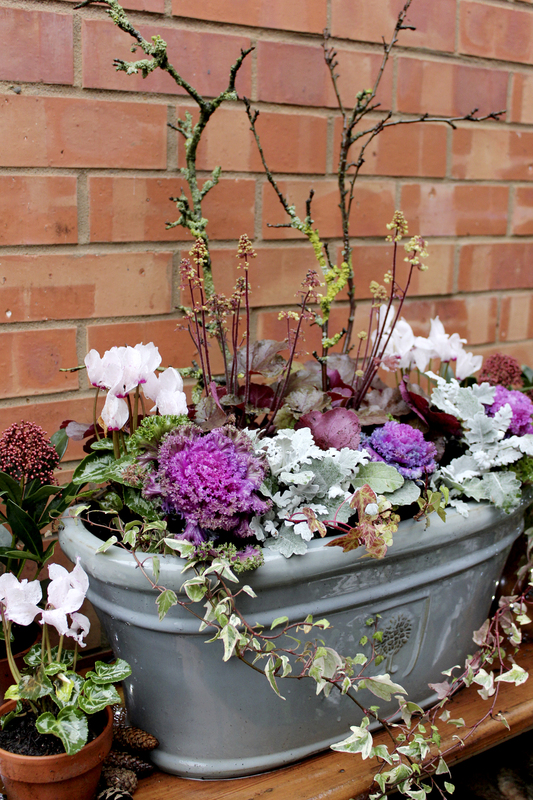 Choose plants that will have a same colour scheme and watering requirements. I created a little landscape in my greenhouse using lichen-covered twigs as deciduous trees and other small shrubs that looked like a forest. Then I realised that the fairies might not be able to get into their garden so my friend made a hobbit ladder out of small pieces of wood and kebab sticks. Hobbits will need a helping hand, so a ladder was duly constructed. 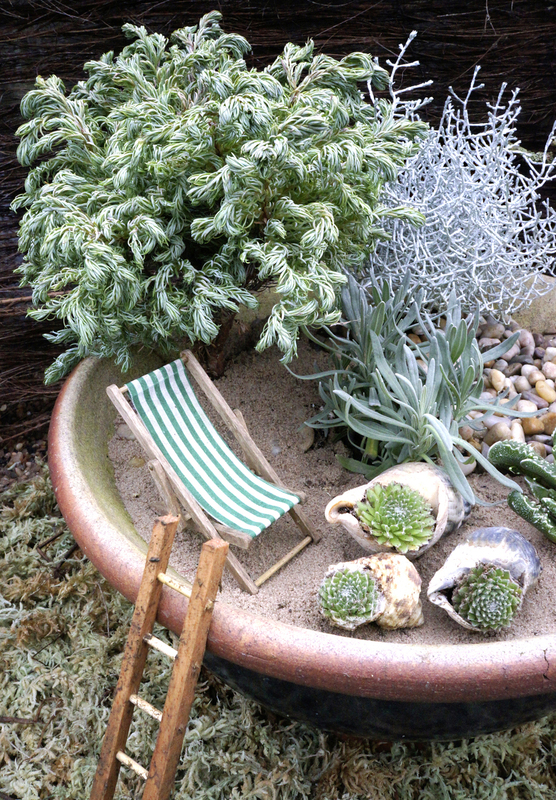 It’s got to look like a miniature landscape so small evergreen conifers and tiny leaved shrubs all work well. Sand, small pebbles and shells will add drama. 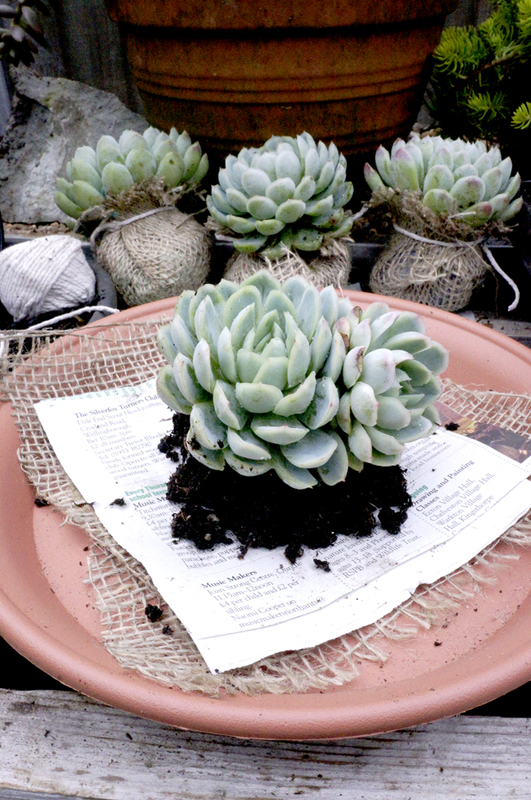 I stuffed baby succulents left over from the wreath into the larger shells. Dolls house deck chair and a homemade Hobbit ladder completed the look. 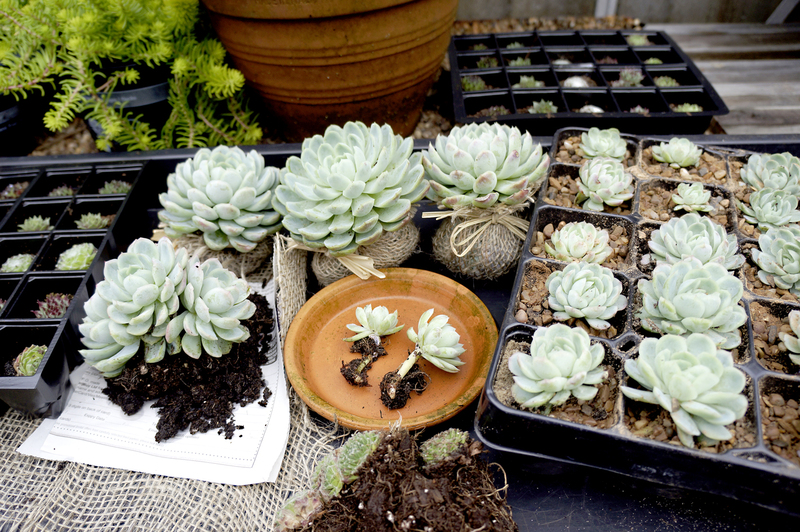 Working with succulents is a chance to divide them to make more plants. Whilst creating these decorations I am planting up the baby off-shoots. Check the off-shoots have some roots of their own before cutting from the mother. Then insert into compost mixed with sand for good drainage. Water lightly and dress with gravel. For the hanging decorations I cut squares of newspaper and a square of pond hessian (60p a sheet) and placed the plant in the middle. 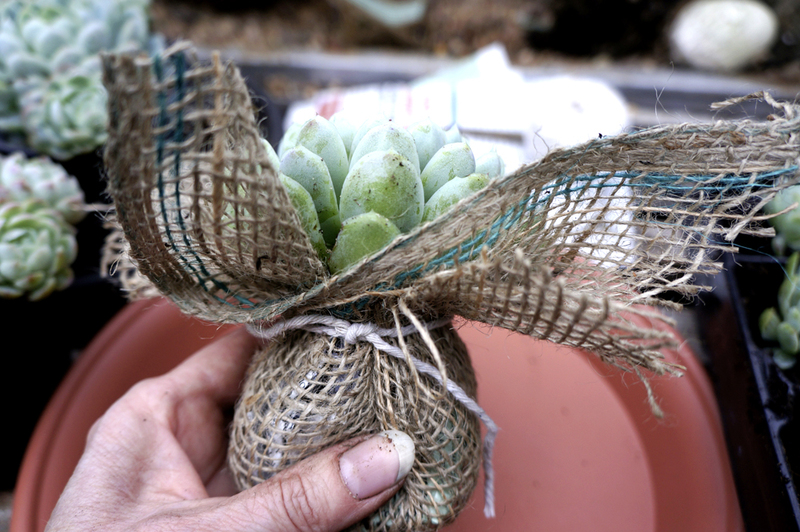 Gather up and tie, not too tightly, around the neck of the plant. 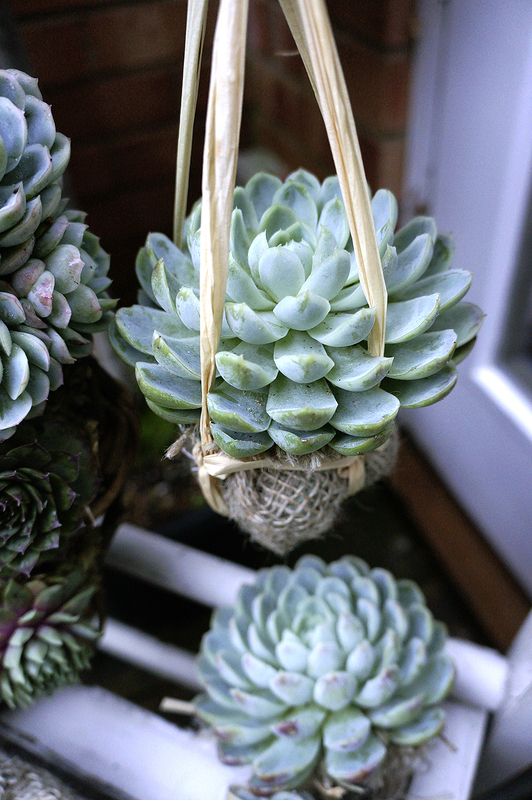 Then using raffia tie around the plant base and make a basket. You can now hang these from small trees in a sheltered spot or in a conservatory. Squares of newspaper and pond hessian. Gather up and tie with gently with string. Thanks to: Roly Scotney for the Hobbit Ladder. Your work is truly stunning and highly refreshing.